We enjoyed an amazing 2018 Boston Marathon weekend for our 11th continuous year and as usual each Boston marathon weekend is different. This year it was the weather with cold temperatures hovering around zero, strong winds and driving rain making running conditions tough and definitely a race for the strong of mind. The runners with us on our bus had a big advantage over all the other athletes. Our athletes stayed warm and dry on our bus until it was time to run and they just hopped on the spectator bus to Hopkinton and joined their corral and ran. As testimony to this we had 3 PR’s on a tough, tough day to run. Contrast this with the hundreds if not thousands of runners at the athletes village huddled together to stay dry and warm and we witnessed top quality athletes shivering uncontrollably at the start line before they had even run a step. After the marathon was over our runners walked up Arlington Street to Beacon Street and jumped on our bus opposite the Cheers Bars where they had food, drink and a change of clothes before heading into Cheers for a celebratory drink. 2018 Athlete comments: “Thank you for the great weekend. I have lots of great memories from our Boston Marathon weekend”. “That makes 3 great trips with you so far, I will certainly remember the weather on this one”. “Trip was an amazing experience, you guys are awesome”. “Please be advised that we had a marvelous time on your tour and we will endeavor to promote your company. Helena, I don’t know how to express my gratitude for the motherly care you gave me after my marathon; I shall remember that for a very long time. To both of you,thank you so much”! Welcome on board our 12th annual bus tour to the Boston Marathon departing N.B. on the morning of Friday 12 April. All you have to do is sit back relax and prepare yourself for Monday mornings adventure. 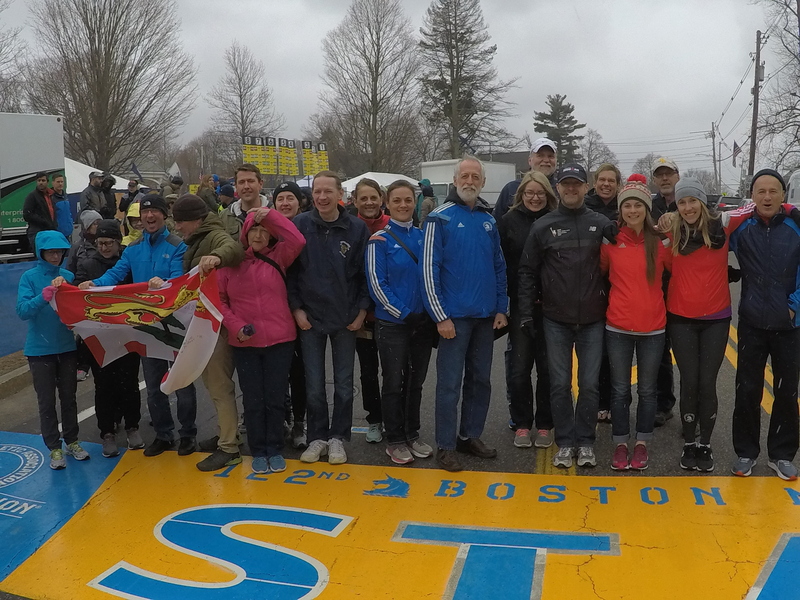 Over the last few years the highlight of this tour for many of us non-runners has been watching the thousands of runners wind their way through Hopkinton to the start of the race – a truly inspirational sight. We will also be featuring the Boston 5k on Saturday morning so you can still experience the thrill of crossing the official finish line and we will also offer transfers to the race Expo in Boston as well as lots of free time in the city for shopping and sightseeing. Why not make a sporting weekend of it and grab some tickets for the Red Sox, Baseball or maybe the Boston Bruins if they make it to the playoffs – a great sporting weekend for every taste. Prices: $519.00 Quad* – $579.00 Triple – $677.00 Double – $999.00 Single – all prices are per person. Daily Shuttle Service to Boston Picks Ups from Salisbury Big Stop, Seely Street B&B & Saint John Trade & Convention Center. “Want to thank you for such an amazing trip and can’t wait to join you guys next year”. We have negociated a Marathon Policy with Manulife Insurance which will cover you while taking part in the Boston Marathon provided that you are not claiming for any pre-exisiting injury or medical condition prior to the start of the race. Contact us for prices and details. Please do not travel into the USA without Medical Insurance. Seely Street Bed & Breakfast – If you are traveling from our of town we can offer you accommodation at our B&B on Seely Street for only $80.00 per room plus tax. At you own risk, your car can be parked at our house while we are in Boston. The bus will depart from our house. All prices are per person. $100.00 per person non-refundable deposit required. Balance due 8 weeks prior to departure. Minimum 25 people required for this group departure otherwise pricing may be affected. No refund on deposits and refunds cannot be issue due to injury. Once your balance is paid all claims must be made through your Travel Insurance. Fuel Surcharge – given the current volatility of fuel prices the bus company (Optimum Ride) may need to readjust the cost estimate as the travel date approaches. If the diesel fuel rate exceeds $1.39 per litre we will add a 5% fuel surcharge to the cost of the tour and if diesel fuel exceeds $1.46 per liter we will add a 7.5% fuel surcharge to your final payment. Hello, is your Boston Marathon 2011 tour full? I just wanted to say a big thank-you to Garth, Helena & Johnny for making the trip so enjoyable. This was my second time travelling to the race with Garth and Helena and I can’t wait to go again. Everything went off like clockwork! The level of detail and care that they have put into the trip was tremendous… all I had to do was run! The bus is always the best way to travel, no fuss no confusion and making friends with the other runners is the cream on top of the cake. Thanks for making the trip and the whole event memorable. You guys are tops! It was our pleasure, always fun to have you on board – hope you are keeping well, see you soon on the circuit and thanks for the comments. and generally providing us with a most wonderful experience. They are knowledgeable, accommodating and professional… 5 Star! We learned so much – much more than I expected to on that “trial run” of Boston. Thank you! We’ll see in April how it all pays off…. If you’re going to Boston, especially for the 1st time, get on the bus with Garth & Helena! You’ll not be sorry and you’ll be back next time you go. I had heard great things about this trip and found them to be all true! They just make everything (except maybe the running part…) painless. Thank you for the very kind comments, it was great having you both with us in 2014 and we are looking forward to seeing Alex run next April in the Marathon. Do you get a finisher medal for the 5km? Thanks for your message for the last few years there has been a finishers medal and T-shirt for all the 5k runners. Hope this helps, if you need any more info about the tour let me know. I’m curious, how long the bus ride is from point A to point B for the Boston Marathon tour ? Hi, Thanks for your message but in order to answer your question I need you to tell me where point A and point B are? Sorry about that, the bus that departs N.B each year for the Boston Marathon. We depart Saint John at 8.15am and arrive in Boston around 5.00pm.